This month I am hosting the Fresh from the Oven challenge! As you probably know, or can guess, Fresh from the Oven is a monthly bread baking group, where we have tried everything from Croissants to chocolate buns to no-knead bread. So why oh why out of all the breads I could have chosen did I go for pizza? It’s a good question and it seemed to make sense at the time, a few months ago after eating one too many Dominoes pizzas something snapped inside. I didn’t want to do this anymore, I wasn’t enjoying getting takeaway. Something about the heavy bases, too much cheese and never getting quite the perfect combination of toppings had ruined eating pizza for me. It took a while to dawn on me that I could just make my own. While I love the healthy side to this Wholewheat pizza dough the overall pizza made from Peter Reinhart’s recipe for Pizza Napoletana in The Bread Baker’s Apprentice is definitely the better of the two recipes. This recipe should be made over two days. The first step is very quick and takes less than 20 minutes before popping the dough in the fridge. The second step includes the famous pizza toss, which is of course a requirement of the challenge 😉 Only kidding, I don’t want to drop my dough on the kitchen floor any more than you do, but if you feel up to it I’d love to see some action shots! The recipe amounts make 6 9-12 inch pizzas, which I think is rather a lot, even if you can keep the dough in the fridge for 3 days or in the freezer for 3 months! I made a third of the recipe, which was enough for two perfectly sized individual pizzas. The amounts for 1/3 quantities are given in brackets. 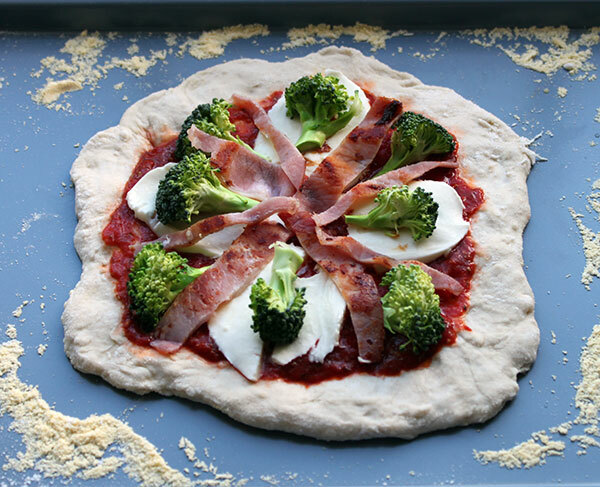 While you don’t need any special equipment for this recipe (I don’t have any of the following) a pizza stone and peel may help with the final outcome. 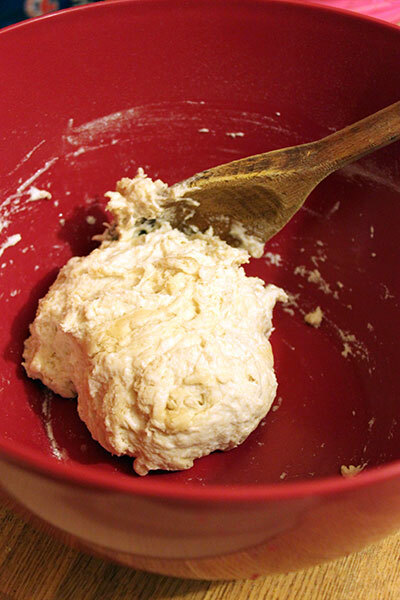 Oh and if you have an electric mixer with dough attachment that would be good – but if you don’t you can do it the old fashioned way, just like me! 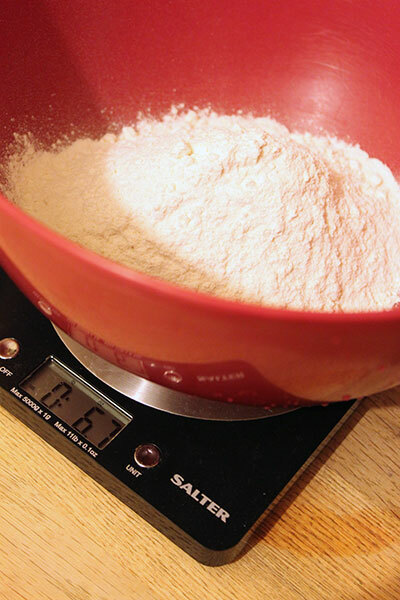 Stir together the flour, salt and instant yeast in a large bowl. With a large metal spoon (I used a wooden spoon and it didn’t seem to make any difference) stir in the oil and water until all the flour is absorbed. To do by hand, you need to stir with one hand and turn the bowl in the opposite direction with your other hand. You need to do this for 5 to 7 minutes, occasionally changing the direction as to really help develop the gluten. 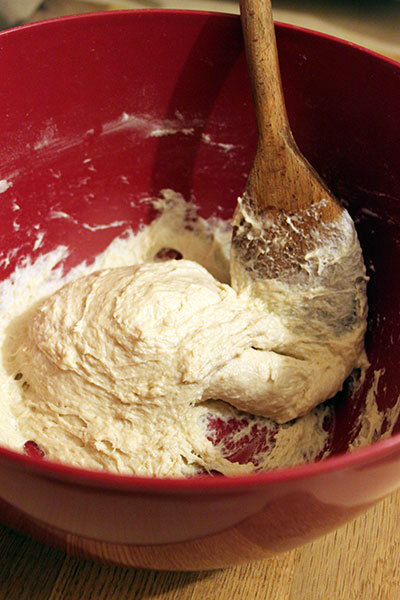 This method of mixing is actually quite a difficult task, sort of like rubbing your tummy while tapping your head, but as long as you are mixing the dough it should work out ok.
To do in a mixer, make sure you are using the dough hook attachment and mix on medium speed for 5 to 7 minutes. 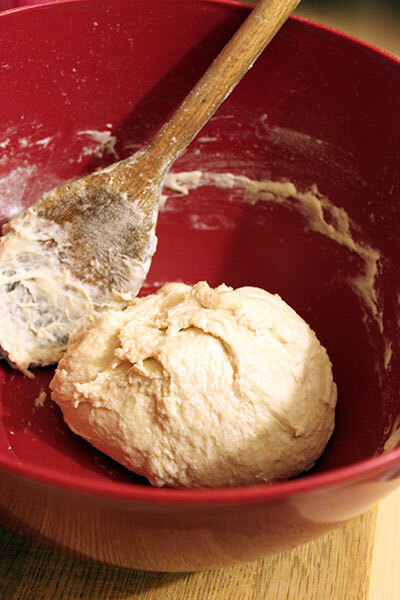 Either way you mix you should end up with a smooth dough which is a little sticky. It should clear the sides of the bowl but not the bottom. If it isn’t clearing the sides then add a little more flour and mix again. If it clears the bottom then add a couple of drops of water, and mix again. The finished dough should be springy, elastic and sticky but not tacky. If you use a thermometer it should register somewhere between 50 to 55 oF. Now prepare a sheet pan with baking parchment and spray oil. 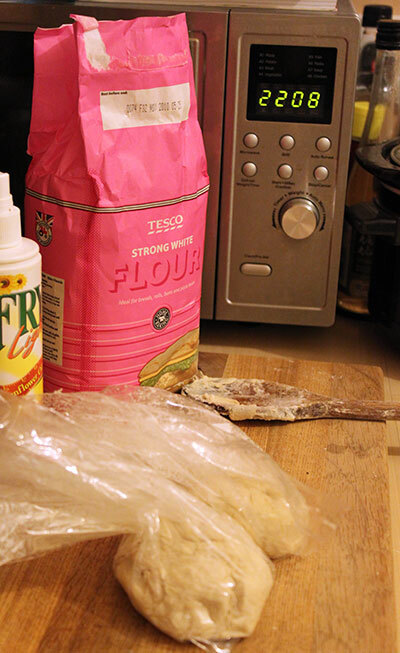 Flour your counter and remove the dough on to the counter. Using a metal dough scraper (or your hands) create 6 equals sized pieces of dough. (I only made 2 using my 1/3 ingredients). Flour your hands and shape each into a ball, if your hands stick add more flour and try again. Place each ball onto your sheet pan, spray each piece of dough with oil. Once all pieces of dough are on the tray, enclose it in a food-grade bag and pop it into the fridge. Because I was only making a small quantity of dough, I didn’t use a tray at all, I just added each ball to a food-grade bag which I had sprayed the insides with oil. Then popped each bag into the fridge. The next day a couple of hours before you want to cook them remove the dough from the fridge. Dust your counter with flour (and your hands) then spray oil on top. Place each ball on the counter and then gently press each into a flat disc about 1/2 inch thick. Top each with a little flour and oil and cover with another bag. Let rest for 2 hours. At least 45 minutes before cooking put on your oven on at it’s maximum temperature (mine goes up to 250 oC, which worked ok) up to 800oF. If you have a baking stone put it in the oven now. If you don’t have a stone then you can use a normal baking sheet, just don’t preheat it first. Now comes the tricky part to stretch out your dough, dust your peel or sheet pan with semolina flour or cornmeal. Coat your hands in flour including the backs and your knuckles. 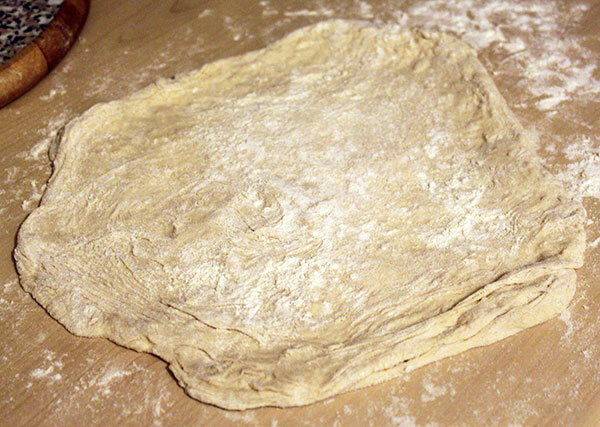 Gently lay the dough on to the top of your fists and carefully stretch it by bouncing the dough in a circular motion. As it starts to spread out you can move to the full toss method (flinging it above your head and hoping it doesn’t fall on the floor – good luck!). If it sticks to your hands at any point lay it out flat and redust your hands, continue stretching until it is the desired width. With my dough I found it really hard to stretch my dough this way (as it kept tearing) so I stretched it gently on a well floured work surface. You can also roll it out using a rolling pin, but this isn’t quite such a good method for working with the dough. Once you have reached the desired width place the stretched dough on the peel or baking sheet. Now you can top it as you wish. 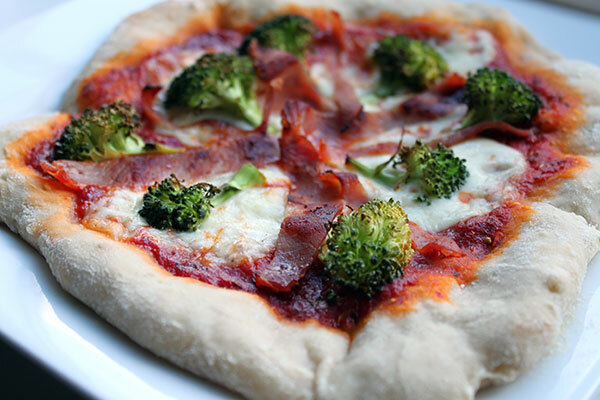 I used a thin layer of tomato sauce, mozzarella, bacon and broccoli. Now that your oven should have preheated, transfer the pizza to your oven. It should only take between 8 and 10 minutes to cook. You might want to turn it 180 degrees after 2 minutes, if you think it might over cook on one side. And voila and you have one authentic Italian pizza dough!